Deb's Cup of Tea: Potato Crisps? Seriously? My friend Doo works at Neiman Marcus, often referred to as "Needless Markup". 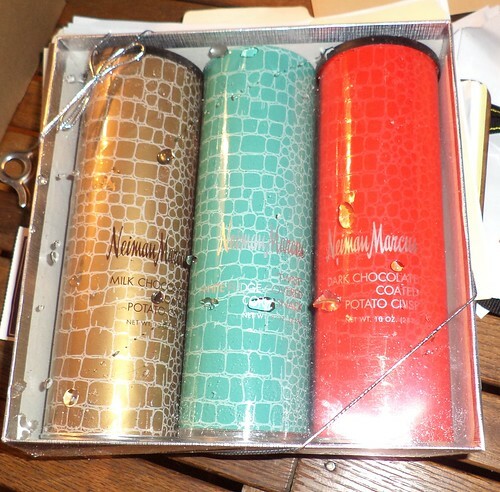 For Christmas, he sent a box with three containers of chocolate covered items. "Let me know what you think of these," he said. Oh excuse me. The can says, "Milk chocolate coated potato crisps". Outside the rarefied air of NM, we call them Pringles. Next we have white fudge covered corn snacks. That's what it says on the container. 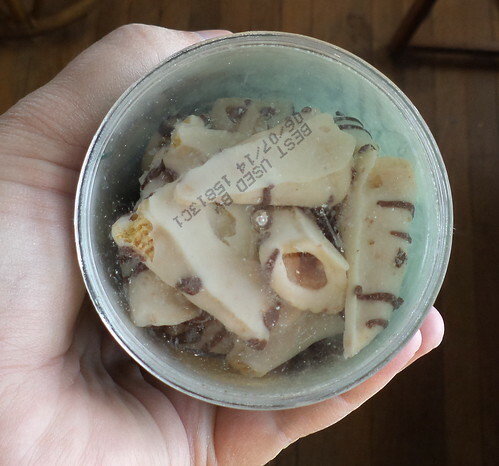 This container was a bear to open. It had a plastic tube insert that was devoid of any lip to grab to open. I finally resorted to using a knife to cut through the tube right below the plug and opening it that way. 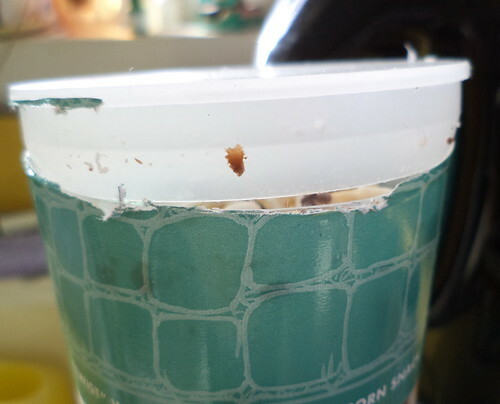 The other two containers had a plastic top which, when removed, revealed a pop top, just like a Pringles can. All I could think was, "These better be good", after it took me 15 minutes to get into the container. 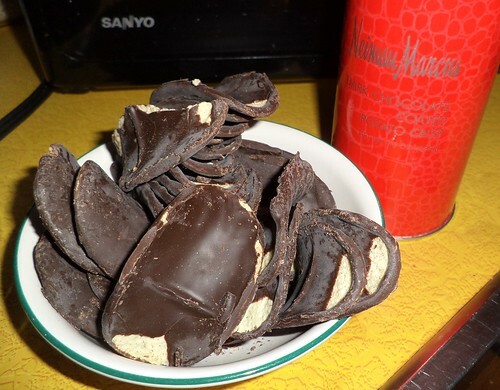 Chocolate covered Bugles. 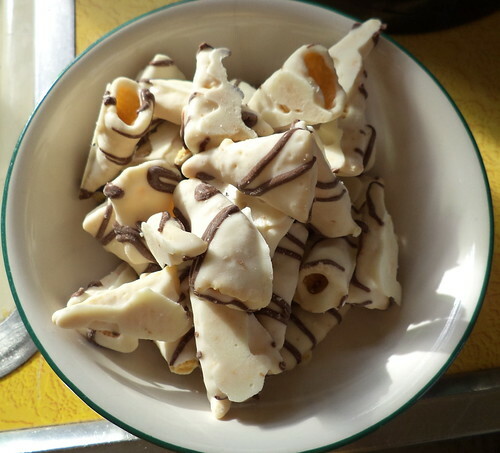 Yup, that's what these are, chocolate covered Bugles. The red tube was the same as the first one except it was dark chocolate. What are my impressions? I haven't finished the dark chocolate Pringles. The chocolate is very rich so I nosh on a couple while cooking dinner or as a late night snack. That's probably a good thing, that I'm not eating them on after another. While they are good, I don't like them as much as the others. The white fudge Bugles took me three days to consume mainly because the white fudge was very sweet and rich and not something I wanted to eat the whole container of in one sitting. Don't get me wrong. This is a good thing. Being forced to not eat everything in one sitting is good for my health. 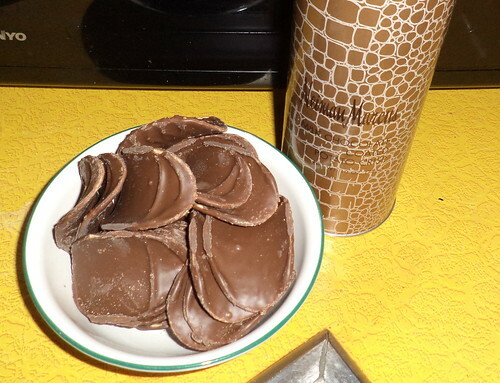 I really liked the milk chocolate covered Pringles. I don't remember if I've had chocolate covered potato chips, which is what this is a direct take off of. I like milk chocolate probably the best and the Pringles were crispy and a bit salty. The flavor combination was good. With the dark chocolate Pringles, the chips are kind of stale, which might be because these would have been produced in mass quantities in October and I'm just now getting around to them in January. The salt is also missing from the dark chocolate Pringles and I do think that makes the flavor of the milk chocolate ones. For the Bugles, it's as if they bought seconds, the misshapen or otherwise unfix for bags of Bugles snacks and covered them with fudge. There's nothing wrong with that, but they were missing Bugles' saltiness. I won't tell you what the price sticker said on the underside of the box. I know Doo didn't pay nearly what the sticker said. 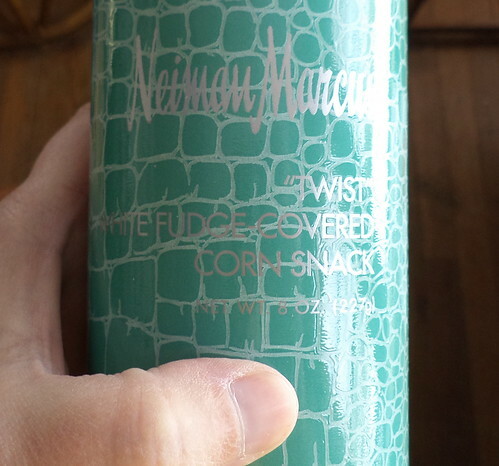 It was a very interesting diversion and I enjoyed the vicarious thrill of eating Nieman Marcus branded snacks.